Do you sometimes round your back when you deadlift? 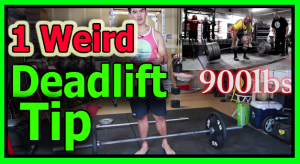 This 1 weird deadlift teaching technique works like a charm if you’re having trouble getting a client to keep their back straight when it comes to the barbel deadlift. If you’re a beginner this technique might a bit difficult, but if you can master it you ‘ll be on your way to deadlifting without back pain. This Deadift Technique video details how to do what I’m asking, without lifting the weight. It’s a training and teaching tool helps improve motor patterns to prevent low back pain in the deadlift and of course, lift more weight.